Should you let your first-level connections see all of your other first-level connections? Should you let them search into the entire list? This question can lead to a lively debate. Typical answers include: That’s not fair! Networking is about sharing and Of course, I hide them—that’s my client list! or You want to have your cake and eat it too if you hide them. Under the Me icon on the right side of your top toolbar, choose Settings & Privacy from the drop-down menu, then Privacy, and then select Who can see your connections. Your current setting will either be Your connections or Only you. 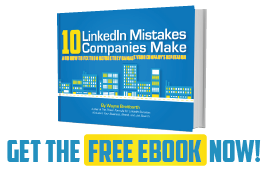 This is one of the most critical strategy decisions you have to make on LinkedIn. However, the fact that 24% of the respondents are unsure suggests many people are not even making a conscious decision about it. 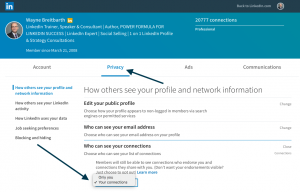 LinkedIn is a networking site, which undoubtedly is why the default setting allows your first-level connections to view your network. I personally want to help my network in any way possible, and I look to my connections to assist me as well. As a result, I have chosen the default setting (Your connections). There are certainly legitimate arguments that support the decision to hide your connections. This list of Frequently Asked Questions should help you make the best decision for your situation. Q: Why are people hiding their connections from their network? It doesn’t seem fair. A: Most of the time they are doing it because some of their direct connections (first level) are names they want to keep confidential (typically clients). As far as whether it's fair or not, I used to feel it was unfair. However, I then realized some people would not be on LinkedIn if they weren't able to hide their connections. That being said, I'm glad the control exists, because the more people on LinkedIn, the better for all of us. Q: If my search uncovers a second-level connection but our common first-level connection has hidden his/her connections, will I be able to tell who our common first-level connection is? A: The great news is the answer is yes. That is why people who choose to hide their connections are still important people to have in your network. 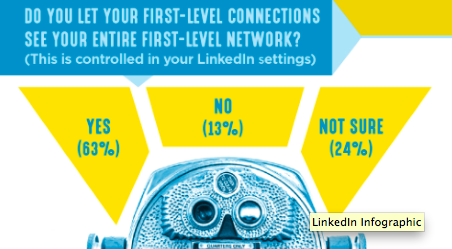 Q: What types of people are choosing to hide their first-level connections on LinkedIn? A: These are typically people who provide professional services, such as accountants, attorneys, insurance and financial brokers, architects. I also see some CEOs and company presidents making this choice. Q: Can second- or third-degree connections or fellow group members ever see my first-level connections? A: No. If you want to share your first-level network with them, you will need to invite them to become first-level connections. Q: Can I pick and choose the people in my network that I will allow to see my connections? A: No. It’s all or nothing. At this time the setting applies to all first-level connections. Q: If I choose to display my first-level connections, do you think I should connect with competitors? A: My quick answer is are you nuts? Would you hand over your database of your most precious business connections (including clients) to your competitors? My not-so-quick answer is sometimes relationships are more complex than that. Perhaps your competitor is also one of your suppliers. So you have to weigh all the pros and cons. Also, if you think you're better at using LinkedIn than your competitors (i.e., you understand how to use features like the Connections of filter), it may turn out to be quite a competitive advantage to connect with competitors. You can look at their network, but they may not realize they can look at your network. Q: If you hide your connections, are you able to look through other people's connections? A: Yes, you can look through the connections of people in your first-level network (as long as they haven't also chosen to hide their connections). However, since you've chosen to hide your network, you won't be able to help your friends find people in your network who might be able to help them unless you change your setting for a period of time so they can search through your network. Armed with this information, you should now be ready to make a strategic decision about whether or not to hide your connections. 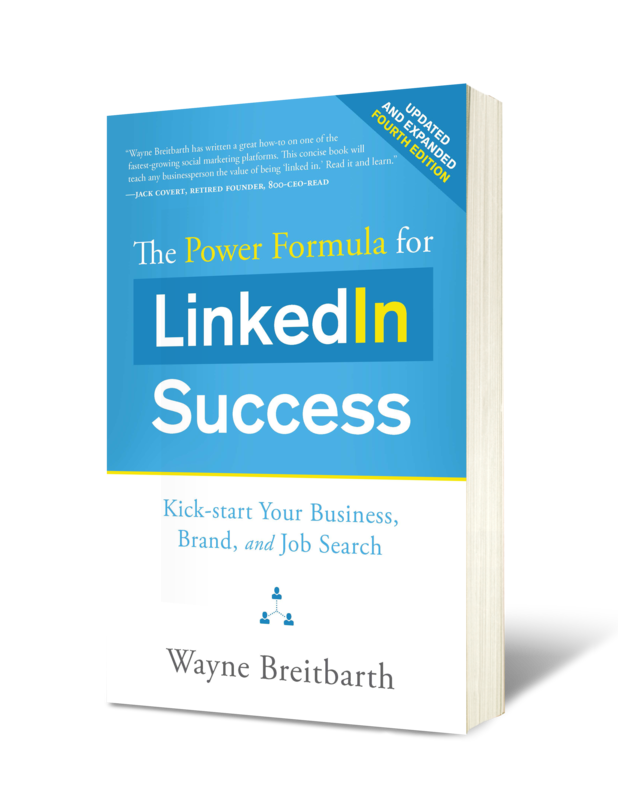 For information about other important LinkedIn settings, check out Chapter 17 of my book, Your Account, Your Settings—Your Way.